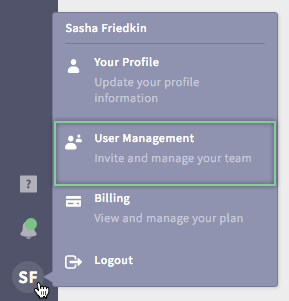 Step 1: Hover over your user icon on the bottom right-hand side of the page and click on User Management. Step 2: Click Invite User. Step 3: Enter the email address of the person you'd like to invite. Note: If you do not see this option on your dropdown menu, contact support@adstage.io to have this turned on for your account.